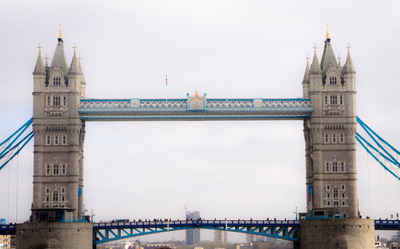 A series on bridges of the world could not be complete without London's Tower Bridge. Standing solid and proud it really seems to encapsulate lots about England that we might either love or hate. It had not been an easy decision to build the bridge back in the late 1800s when it was agreed that a bridge was required to speed up travel between different areas of the city. Concerns were raised about a bridge upsetting the flow of ships down the Thames so debates about design began. A Committee, The Special Bridge or Subway Committee, was formed in 1876 and the public was provided with opportunities to develop designs for the bridge. Over 50 designs were received and it was in 1884 that the design was finally chosen. Horace Jones, the city architect, and John Wolfe Barry were the chosen designers. It took eight years for the bridge to be built with 432 construction workers hired during that time. It was the first bridge across the Thames and of course since then many more bridges have been built. The bridge opened up for ships to pass and had a pedestrian footway that could allow pedestrians to walk over the bridge even when it was open for ships to pass through. In 1910 the pedestrian footway was closed due to lack of use as people didn't want to climb up the towers, rather they waited at street level to cross when they could. The walkway was reopened in 1982 and its panoramic views of London are well appreciated by tourists and locals alike. The bridge had been colored chocolate brown until the Queen's Silver Jubilee in 1977 when the colors changed to red, blue and white as they are today. Such history, such distinctive architecture and such dignity gracing the Thames make this one of my favorite bridges to admire from afar.